Most musicians, actors, and other people in media have consistently stated that every piece of entertainment in the world would be nothing without its fans. 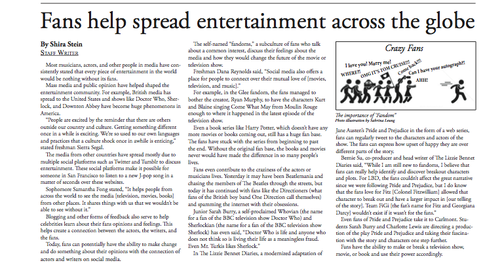 Mass media and public opinion have helped shaped the entertainment community. For example, British media has spread to the United States and shows like Doctor Who, Sherlock, and Downton Abbey have become huge phenomenons in America. “People are excited by the reminder that there are others outside our country and culture. Getting something different once in a while is exciting. We’re so used to our own languages and practices that a culture shock once in awhile is enticing,” stated freshman Sierra Segal. The media from other countries have spread mostly due to multiple social platforms such as Twitter and Tumblr to discuss entertainment. These social platforms make it possible for someone in San Francisco to listen to a new J-pop song in a matter of seconds over these websites. Blogging and other forms of feedback also serve to help celebrities learn about their fans opinions and feelings. This helps create a connection between the actors, the writers, and the fans. Today, fans can potentially have the ability to make change and do something about their opinions with the connection of actors and writers on social media. The self-named “fandoms,” a subculture of fans who talk about a common interest, discuss their feelings about the media and how they would change the future of the movie or television show. For example, in the Glee fandom, the fans managed to bother the creator, Ryan Murphy, to have the characters Kurt and Blaine singing Come What May from Moulin Rouge enough to where it happened in the latest episode of the television show. Even a book series like Harry Potter, which doesn’t have any more movies or books coming out, still has a huge fan base. The fans have stuck with the series from beginning to past the end. Without the original fan base, the books and movies never would have made the difference in so many people’s lives. Fans even contribute to the craziness of the actors or musicians lives. Yesterday it may have been Beatlemania and chasing the members of The Beatles through the streets, but today it has continued with fans like the Directioners (what fans of the British boy band One Direction call themselves) and spamming the internet with their obsessions. In The Lizzie Bennet Diaries, a modernized adaptation of Jane Austen’s Pride and Prejudice in the form of a web series, fans can regularly tweet to the characters and actors of the show. The fans can express how upset of happy they are over different parts of the story. Even fans of Pride and Prejudice take it to Carlmont. Students Sarah Burry and Charlotte Lewis are directing a production of the play Pride and Prejudice and taking their fascination with the story and characters one step further. Fans have the ability to make or break a television show, movie, or book and use their power accordingly.